A child picks up a crayon and marks a colorful line across a piece of paper. It’s one of most natural human experiences: Tactile, haphazard, and raw. But in making the transition to digital, much of that simplicity disappears. Cold glass replaces silky paper, and suddenly you get toolbars and buttons and files. Pencil is a Bluetooth stylus that tries to help you forget you’re working on an iPad. The pencil comes in two versions: The $49.95 Graphite, and the $59.95 Walnut, encased in what looks and feels like natural wood. The Walnut version also includes a magnetic snap that allow you to stick it to the iPad’s smart cover. That’s the model we’ll be reviewing and giving away. The Pencil is a very specific stylus: Not only is it meant just for one device (the iPad), but it actually works best with one particular application: Paper Introducing Paper, A Simply Beautiful Sketchbook App [iPad] Introducing Paper, A Simply Beautiful Sketchbook App [iPad] Paper by Studio Fifty Three (iTunes link), which is admittedly a rather un-Googleable name for an app, is the ultimate in distraction-free simplified idea sketching. Your options are ridiculously limited - but that's part of... Read More , by FiftyThree. 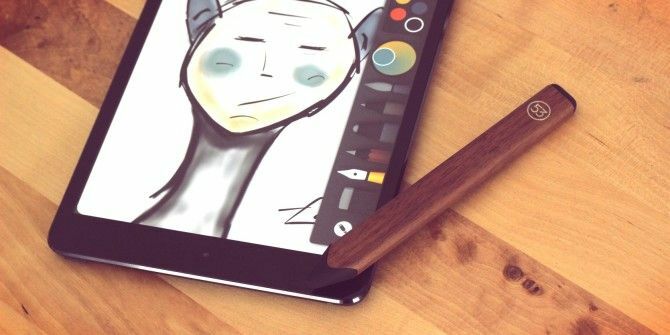 This is one of the most celebrated drawing apps for the iPad. The app itself is free, but many of its more advanced features have to be unlocked using in-app purchase, or by purchasing the Pencil. As soon as you pair the Pencil with Paper [No Longer Available], the full suite of drawing tools become available. Of course, Pencil is not the only Bluetooth stylus around. We’ve previously reviewed the Adonit Jot Script Evernote Edition Adonit Jot Script Evernote Edition Review and Giveaway Adonit Jot Script Evernote Edition Review and Giveaway Adonit is a well-known stylus maker, and the Jot Script is their newest product. Unlike most stylus makers, most of Adonit's styluses have unique tips which you won't find on other styluses. Read More , a $75 Bluetooth stylus. It, too, boasts palm rejection (one of the Pencil’s main selling points), but it also prides itself on precision and claims to have the thinnest tip on the market (1.9 millimeters) — a far cry from the Pencil’s bulky, crayon-like tip. The Pencil doesn’t even try to be accurate. But the Jot Script costs $15 more than the pricier Pencil model and is not without its flaws, leaving lots of room for competition. Another notable contender in the Bluetooth stylus arena is the Intuos Creative Stylus, a $100 accessory by Wacom that boasts pro-grade pressure sensitivity (something the Pencil utterly lacks) and works with Photoshop Express, ProCreate Procreate: One Of The Most Beautiful and Powerful iPad Art Apps Available Today Procreate: One Of The Most Beautiful and Powerful iPad Art Apps Available Today Let's set the expectations at the outset here: this is not a post about how I used iPad app Procreate to create amazing artwork, because who cares. Read More , ArtRage [No Longer Available], and Bamboo Paper [No Longer Available]. So it costs twice as much, has pressure sensitivity, and works with four apps rather than just one. The final noteworthy competitor is the Hex3 JaJa, a $90 pressure-sensitive styles that doesn’t use Bluetooth – instead, it uses sound to communicate with any supported tablet, and as such can also support older iPad models. The Pencil supports all iPads with Retina display and the iPad Mini only, while the JaJa can work with the original iPad and iPad 2 as well. The pencil comes packed in a simple cylinder bearing the FiftyThree logo. Within the cylinder you’ll find a molded piece of cardboard holding the Pencil itself, as well as an extra tip and an extra eraser – so hang onto that box even after pulling the Pencil out. The Pencil doesn’t try to be a precision tool. It goes for an organic aesthetic: For one thing, the tip is wide and large, and looks a little bit like a carpenter’s pencil tip. On the other end of the Pencil, you’ll find an eraser, that you can use just like on a regular pencil: Simply flip it and you can erase whatever you drew. The Pencil doesn’t have any charging ports, so as not to compromise its form. Instead, to charge it, you simply pull on the tip and its innards slide out of the wooden casing. You find yourself holding a compact bundle of electronics with a USB plug on its far end. Simply plug it into any USB port, and it’ll charge up. The uncompromising natural look means the Pencil doesn’t have an LED or any other charge state indicator. However, after pairing the Pencil with Paper, you can look up the Pencil’s remaining battery level within the app. Even with the battery dead, you can still use it as a regular, passive stylus. With sparse use, I found that it held its charge just fine for over a week. Pairing the Pencil with your iPad and Paper couldn’t be simpler: Simply press the tip of the Pencil against the pairing button inside Paper, wait for a brief moment, and you’re done. No menus to fiddle with, and there isn’t even an on/off switch on the Pencil itself. It literally is just one step. Because of this pairing, Paper knows when the Pencil is in use. For one thing, all of the custom tools become available even if you didn’t buy them via in-app purchase. But more important, when drawing with the Pencil, you can use your fingers to smear paint around: Paper knows when you’re touching the screen with your fingers, and when you’re touching it using the Pencil. So you can draw a little with the Pencil, smear it around with your fingers, add a dab of paint with the Pencil, smear some more, and so on. This works well for adding highlights and shading, although the smearing sometimes feels too heavy-handed and there’s no way to control it. Another key feature is palm rejection: With the Pencil in use, you no longer have to be careful not to rest your hand on the screen as you’re writing or drawing. You don’t have to worry about making any inadvertent markings on the canvas with your hand: It just works. The Pencil wasn’t meant for accurate engineering drawings. What you get is a way to create art that feels like it could have been made using traditional media. If you’re going for precision here, you’re doing it wrong. Of course, you can also use the Pencil just as a regular stylus, in any other app such as the browser, to scroll around, switch tabs, and so on. It doesn’t have to be charged to work that way. It worked very well on a Nexus 5, as well, effortlessly gliding on the screen. At nearly $60 for this model of the Pencil, this is not an impulse purchase. It is a very cool stylus: It delivers on its promise, and has style to spare. It feels like it was meant for creating art. If you are already using Paper and are serious about using the iPad to give your thoughts visual form, the Pencil is a good way to do so. Congratulations, Daniel Velez! You would have received an email from jackson@makeuseof.com. Please respond before April 4 to claim your prize. Enquires beyond this date will not be entertained. 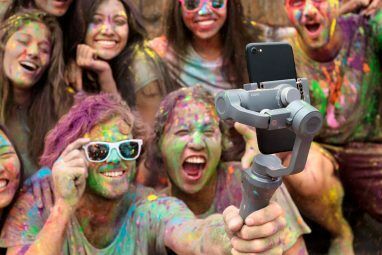 Explore more about: MakeUseOf Giveaway, Mobile Accessory. I just use my finger, but I really like this one and want to get one badly. Best stylus I've ever used would be my finger. I prefer using my fingers, but this stylus looks great, I would lover to try it! I used to use my finger but am thinking of upgrading to a new stylus now! Haven't used a stylus on a tablet, however I did had one with my LG phone - which unfortunately wasn't that great of an experience.. I have never owned a stylus before, just my finger! I use my fingers so far. Dagi makes a good one. I have only tried one type of stylus, it is fairly thin pen style also use my fingers. Would love to win this stylus, looks very interesting with the apps. Thank you for your contests, I enter most!! I have the Adonit Classic. Is one of the best. precise and easy to use. It does not need batteries. But FiftyThree is very good and sophisticated, excellent quality. I used Stylus Pen before but I like to experience a new one. ? I prefer to use my finger. Best stylus I ever used is my finger. Best stylus i ever used was one that i had with my smartphone. Haven't found a great one yet! I don't prefer finger, I used a stylus before but, 53 pencil stylus looks to be the best. I have never used a stylus. Would like to, though. I haven't ever used one that worked as well as I wanted it too. Right now I'm using one that feels like a fat crayon that a toddler would use and it's only redeeming quality is that it's to big to lose. Haven't used a stylus that I like yet! I haven't had a stylus last long enough to become a favorite. Haven't found a stylus I liked enough to keep yet. I'd take a Pencil for free, but I had to return my preordered one when I discovered it won't work on iPads with screen protectors. 53 Pencil Bluetooth Stylus is the best! I have a pen I bought which was essentially very cheap but works so much better for me than a pencil does. Don't expect it to be better than a finger at under $3, but at least it works. I have never used a stylus before, but this one looks pretty cool and I would give it a try. Ive never used a stylus but would love too. Best stylus i ever used was one that came with a wacom tablet. Awesome stuff, really smooth and precise. Although that wasn't my tablet. And i do prefer to use my fingers for touchscreens, it's more comfortable for me. I only used ab old school stylus I learned from you years years ago..love to try this one.. I've only used Pogo. It does its job pretty well but would love to try a new one. I've never used a stylus but unless you count the Nintendo DS Pen, then I would definitely go for it! I prefer a stylus, but couldn't afford one. Very cool looking. I have a young budding artist at home who would love this! Never used one before. Stylus. I dont like to use any stylus. Never used one, but look forward to trying your Pencil! I have never used a stylus. I’ve never used a stylus but I hate using my finger. I've never used a stylus for any sort of touchpad, however I have used a basic stylus on my drawing tablet for PC with good results. Much prefer the stylus to using my finger. I have never used one but think that would be my preference. I've never used a stylus but I HATE using my finger. Never really tried a stylus since I got rid of my PDA. I've never used a BT stylus before, so I prefer my fingers. I prefer my finger, but I would like to try a stylus! My favorite stylus is the Adonit Jot Pro, but any (even the cheapest ones) will do, once they've been modded. I prefer taking a cheap stylus with a mushy (hollow) tip, and injecting it with Shoe Goo, an adhesive hardening gel. While it hardens over several hours, I will tap it on a table so that it forms a slightly flat 'facet' on one side. Once it's hardened, I can write and draw with the flat side down, and it works fairly well. I usually use my finger but this stylus seems pretty good! i got a cheaper stylo but i'd like to buy a good one with a semi-pro level of accuracy. I prefer my finger. Most stylus has the floppy end which is not very accurate. Never used a stylus, so my finger is best for now. A stylus would be much better so you don't get your iPad covered in finger prints. I still prefer my finger for now. I have not come across a stylus that I can comfortably hold for extended periods of time without cramping up. I keep coming back to the Bamboo Stylus. I also have the Jot and the Pogo Sketch. The Pencil looks very cool though. i've been using tin foil! I don't have stylus and currently use my fingers. If I have a chance to win. I will definitely use it. I have never used a stylus but would prefer to use one to my finger. I have only used cheap stylus pens but it would be nice for drawing, taking notes and sketching! I would want one like this to be comfortable and accurate! Very good review guys! Just used the stylus that came with my tablet. so definitely want to try how this feels. I haven't used a stylus yet. I'd like to try this one. Have only used my finger on my nieces iPad, would be great to win this for her. Pogo is my go to Stylus. It works with a large number of apps. Looks intriguing, I'd like to try it! A stylus I make from a pen that I turn on a lathe. So far only cheap stylus and they are frustrating so end up with my finger. I've had horrible experience with styli(? ), and have to this point in time preferred using my hand. The stylus on my Microsoft Surface is great. The feel of it isn't quite 100%, but the functionality (especially in OneNote) is perfect. I just use my fingers. I never really used any devices that use a stylus before. Not much experience with any stylus or apps that use them, new world for me! The only stylus I ever recalled using was for the NDS. Fingers just seems easier. I've only used the stylus that comes with the disney creative app. I've got the new Jot pen stylus, it's pretty sweet. Best stylus I've ever used is a cheapie bought in desperation to overcome a too small touch screen! I've tried a couple stylus, but always end up using my finger. Just havn't found one I like, perhaps because I havn't put enough money in it to get a good one. Would LOVE the FiftyThree Stylus! I'm already using - and enjoying - Paper! I am using Bamboo Stylus at this time, the one that has a pen on one end. That I feel is the best one so far. I have only used my finger, however, I can see this wide carpenter style pencil being so familiar with the Senior Citizens I work with. What a great add-on for their iPad drawings. I've used a couple including the DS light ... coveting this one, though!!! The stylus that comes with the Surface Pro or the Lenovo Helix are pretty good (almost the same design). I haven't found any problems with those. Very nice and very cool! I've never really tried one, always used my finger. I tried, but was not able to enter the contest from my iphone. It would not allow me to type in my email addr. Currently I use the sensu stylus brush... I am trying to expand my stylus collection so I can have a variety of drawing tools though. I use my finger too! I really want this stylus. I don't have a stylus, so i use only my fingers...so drawing is inaccurate.. So far, of the ones I've tried, the Adonit Pro was the best because of its precision. I have a stylus but I don't know what brand it is. I had a boxwave (mesh tip) which I lost (I'm blaming the doggie, she eats all my toys). But nothing near as cool as this. Too cheap to buy a stylus. I use both, styluses are great for drawing and taking notes while my finger is usually better for games and many apps. Just use my finger. Would like to try this one though. I do not usually use either !!!! But.......... I would love to use this new pencil !!! I prefer my finger because that's all I have. This looks great. Hope I win. I just use my finger! I don't enjoy drawing with the iPad because my finger is inaccurate. I would love this stylus to go with my Paper app. Great website. Always looking forward to seeing what you are showing and have to offer. Keep up the good work. Thanks a lot. I haven't used a stylus yet. would love to try it out. I actually have never had any stylus!!! I would like one to try instead of using my finger!!! Haven't met the best stylus yet. They all have their flaws. I'd like to have one and not use my finger.